I'm going to the happiest place on Earth! What’s pan-fried, smokey and delicious? This recipe! It was one of our favorites so far. This meal can be found at the Biergarten in EPCOT. We always skip over this restaurant for one reason or another. We might have to make a stop there one of these days. The recipe was pretty easy to make. I made it on a weekday after work and dinner was served at a reasonable time. 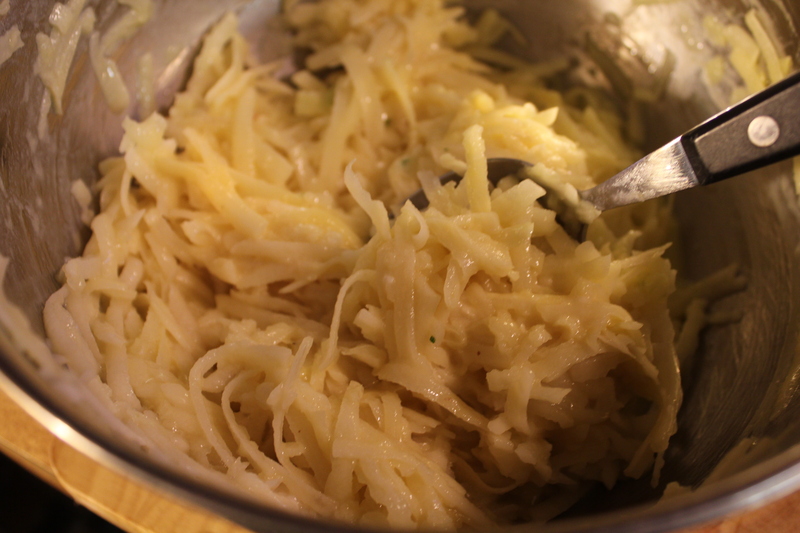 You simply grate the onion and potatoes(they list Idaho Potatoes in the recipe but I’m sure wherever your potatoes hail from, the recipe will work) with a course grater, they shouldn’t be grated too fine. Toss the potatoes and onion in a mixing bowl with the eggs and flour. Season with some salt but be stingy here. While it says to taste, you have to be mindful of the fact that the act of pan-frying will add a lot of flavor. 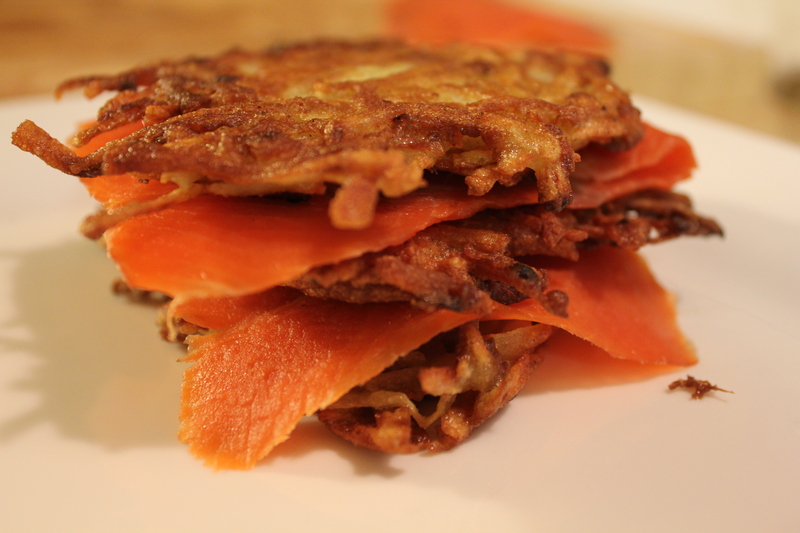 You don’t want this potato pancake to taste like a fast-food french fry. Being light on the salt served me well on the pancake. If in doubt, cook a little of the mixture and taste before moving on. Once the mix is ready, heat some olive or canola oil in a skillet. I used my cast iron skillet, it can’t be beat for heat retention. Once the oil is ready to go, add a tablespoon of the mixture to the skillet and press down with a spatula or other utensil to make the pancake shape. I actually did three pancakes at once. Fry about five minutes each side. 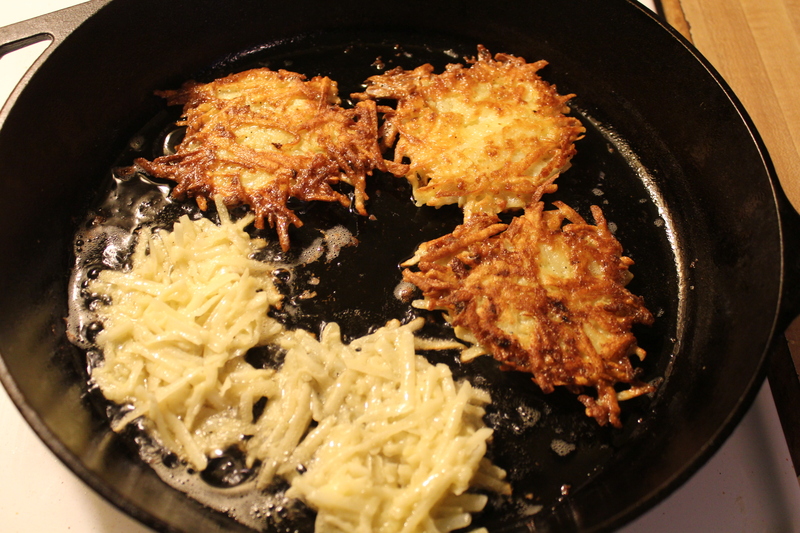 Repeat until the mixture is gone, add more oil if you run low; you don’t want to start burning them instead of frying. 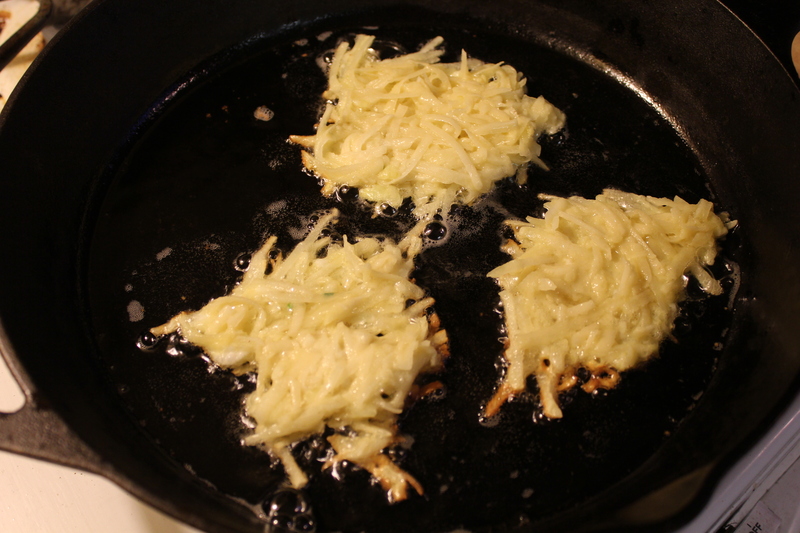 When they were done, I placed them on a paper towel to soak up some of the excess oil. Not only will extra oil cause the pancakes to go soggy, it will raise the calorie count on this dish. 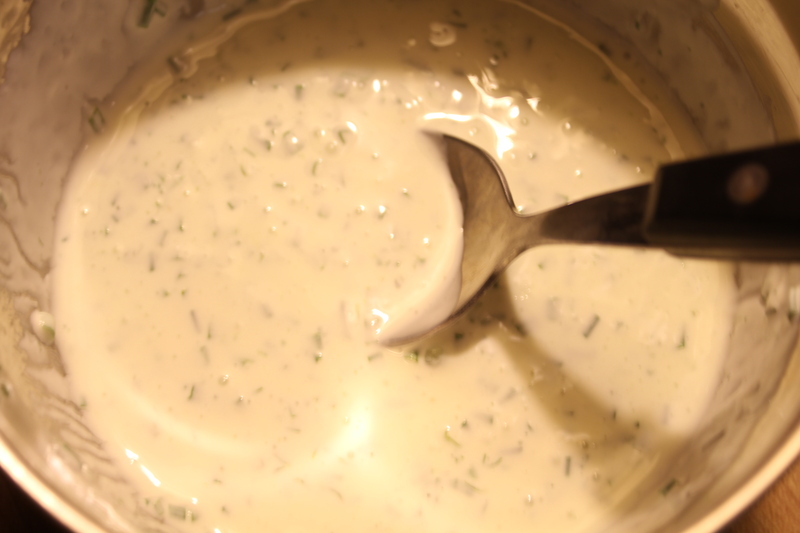 While the potato pancakes were frying, I made one of the toppings, the Chive Sour Cream. All you have to do is mix the sour cream with the finely chopped Chives and the lemon juice. After they are mixed, season with salt and pepper to taste. I went light on the salt again and it did not serve me well here. This topping needed the extra help, I had to go back and add more salt so that the chive and lemon taste would come through. 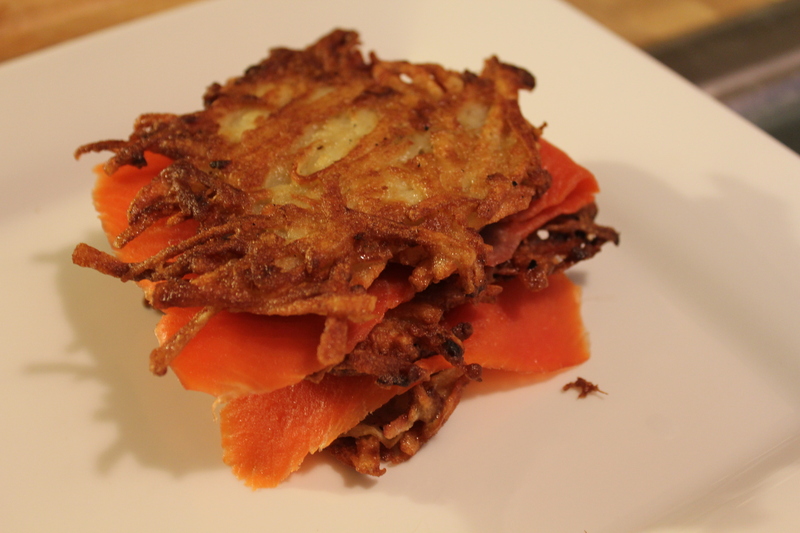 The final component that is needed is some smoked salmon. I don’t use smoked salmon much so I don’t have much to say about this ingredient. 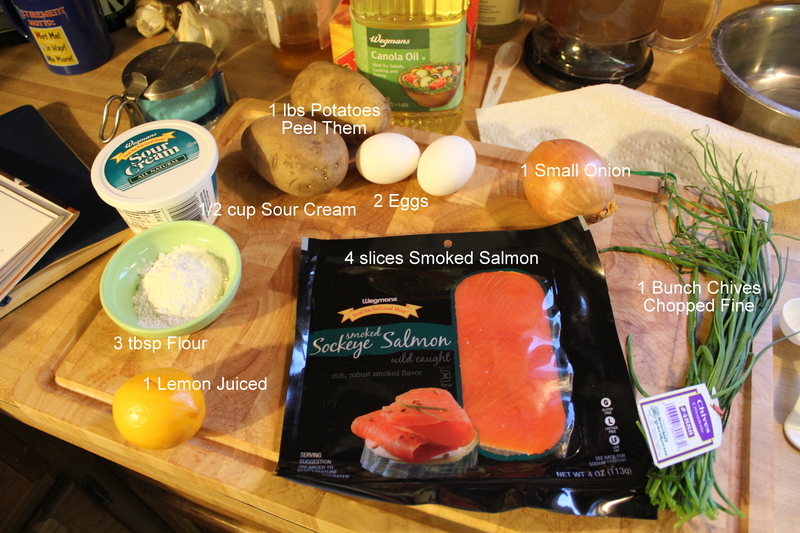 What I can say is that the reason I was happy that I held back on the salt in the pancakes was that this salmon and its intense flavor will be sandwiched between two of the pancakes. 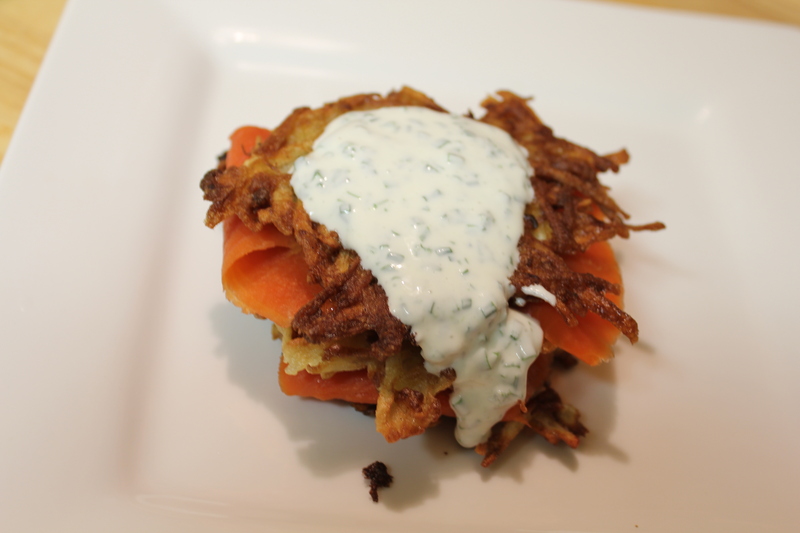 After you have the piece of salmon between two of the pancakes, drizzle with some of the chive sour cream and dig in. I actually added another piece of salmon and a another pancake to the dish as we were eating it as a meal. Enjoy! PS – Ariel loved the smoked salmon. She has expensive tastes.